I’m totally naked, lying face down on a marble slab in an underground cave, and a 200 pound, middle-aged Georgian woman, wearing only a black lace bra and black Spanx, is vigorously and indiscriminately scrubbing my body with a hessian glove. 24 hours earlier, I landed in Tbilisi, Georgia, with two friends, absolutely no grasp of the language, and a shaky-at-best sense of the exchange rate. By the time we left, I still had two friends, still couldn’t remember how to say “thank you” and was already planning how soon I could come back. 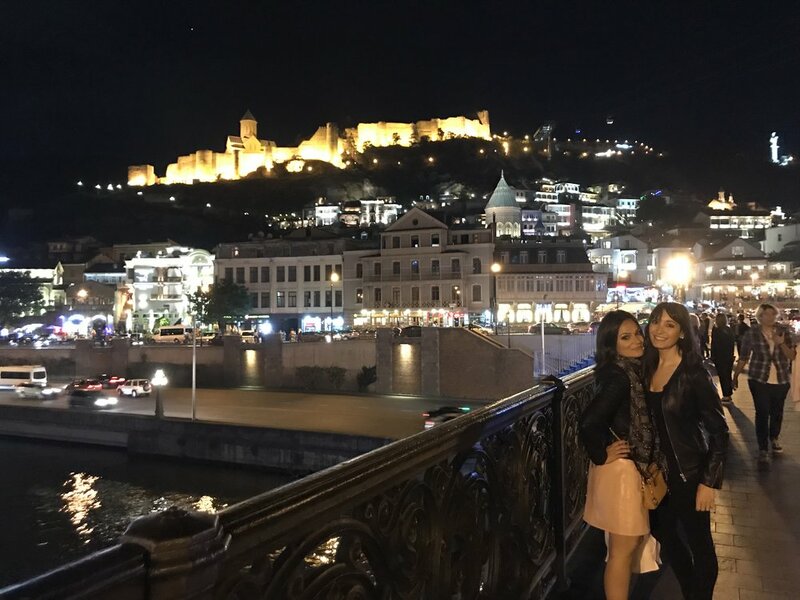 Here’s five reasons why you should make Tbilisi your next destination - for a girls’ trip, a weekend getaway, or a longer adventure! The sulphur baths are a must. Ideally, one would get in a taxi at the airport and head straight there upon arrival. There are various establishments to choose from, all very reasonably priced, with optional massage services. We chose the Orbeliani Baths, mostly because of the stunning mosaic facade, and managed to get a private room (for 110 lari an hour) as walk ins on an Saturday morning. We all opted to pay for the 20 lari scrub/massage, and thus, I found myself in the slightly compromising position described above. It was a luxurious, and decadent, and I loved every minute. The water in the hot bath was super hot, and so the three of us took turns plunging into the tiny “cold” pool every couple of minutes. We could hear a street busker playing an accordion up above us, and every sound echoed off the marble walls. I would recommend going early in the morning, before breakfast (the public rooms are open 24/7, but the private ones open at 9am) - it wouldn’t be as nice on a full stomach. Make sure you take in water to drink, as it’s easy to dehydrate, and I recommend ordering the sweet mint tea as well. From a rooftop tiki bar, to an underground Mafia cafe filled with smoke, to a third floor karaoke bar, to a free street concert by a band made up of sad clowns, Tbilisi’s nightlife is impossible to define. The main drag of nightclubs and bars is similar to that of any party city: loud, crowded, with puddles of questionable liquids underfoot. We started our night by allowing ourselves to be talked into going up three unreasonably steep flights of stairs (the last of which was poorly lit and made us wonder if we were making a chronic error of judgement) to a rooftop bar decorated with bamboo furniture, fairy lights, and gaudy fabrics. We had a beautiful view of the fortress and statue on the hillside one one side, and the cathedral on the other, all of which were beautifully lit. We drank over-sweet cosmopolitans and took a ridiculous number of photos. We wandered down to the main drag of clubs, dipping in and out bars, not sure what we were looking for. More than once, we walked through the doors of an establishment, passed through velvet or silk curtains, and spent five seconds looking around what was almost certainly barely disguised brothel before quickly leaving. We stood in line to get into a karaoke bar, went up four floors in an elevator and emerged into a smoke-filled room, where the backing track was playing at a level made our ears bleed, and a scantily clad Georgian girl was gyrating with a skinny guy in a baseball cap, singing Russian rap lyrics. We went to sit down, and were told that it was 500 lari to sit on the sofas. We tried to order a drink, and find out how to sign up to sing a song, but we were ignored by everyone. After 15 minutes, we left that place too. Back outside, we headed towards the sound of gypsy-style music, and found ourselves in a large crowd in front of an outdoor stage. The music was high energy and fun, even though we had never heard of the band. After an hour or so we made our way back into the city center, and ended up on another rooftop, listening to a Caribbean band playing funky jazz covers, sharing a bottle of Georgian sparkling wine, and a shisha pipe. We felt like we had visited five different countries - or at least five different cities - since leaving our Airbnb. On our first afternoon in Tbilisi - in a new country, where there were sights to see, and shopping to do, and new streets to explore…we spent three hours having lunch. We didn’t mean to, but the combination of the ridiculously cheap prices, the ridiculously delicious flavors, and the ridiculously slow service, found us still sitting around an old wooden table in a Pinterest-worthy cafe, sipping espresso, three hours after we first sat down. Everything we ate over the weekend was delicious and unique. Typical Georgian dishes were flavored with walnut and pomegranate, which made for a lovely, rich, yet tart flavor - it was almost like curry. The produce was fresh and the food was all “home-style” cooking, but this meant that service was VERY slow. We made the mistake on our second morning of waiting till we were already hungry to sit down to eat… we were almost chewing on the table by the time our meals arrived! The Georgian specialties include delicious steamed dumplings, cheesy bread, and beans baked in a clay pot - all were filling, delicious, local and cheap. On our first night, we found a beautiful street of restaurants with outdoor seating, and ordered delicious grilled vegetables (which turned out to be tempura), and a cheesy, fondue-style eggplant dish in a clay pot. We dealt with the richness of the food by drinking a couple of bottles of local wine (see below) and then impulse-buying a set of the plates on which the food was served from the restaurant. On every street corner there were stores selling churchkhela, the local sweet. Walnuts, raisins, almonds and chocolate are threaded onto a string, and then dipped in grape juice, which hardens into the consistency of a fruit roll up. They looked utterly bizarre - a cross between an intestine and a stick of beef jerky - but they were tasty and a great snack, and we all bought huge bags to bring back with us. When you live in a “dry” country (and Im not just talking about the climate), wine becomes a major focus of your tourism. I read a little about Georgian wine before we visited - they let it age in clay pots instead of oak barrels, and it gives it a unique flavor. We made a point of drinking wine with every meal, and it was glorious. On our last night, we stopped into a fancy wine shop which was offering a tasting, and while we sampled the different flavors, a chatty Georgian called George, filled us in on the best wine regions and the history of wine making in the country. He also told us that we were getting ripped off by the taxi drivers - paying three or four times the going rate! The city itself is beautiful. The buildings were old and gorgeous, the art scene was vivid, and the views from the hillside were worth the climb. Once we finished our marathon lunch, we headed straight for the Dry Bridge Market: an amazing time-warp of ex-soviet trinkets, handmade pottery, avant-garde paintings. The old and new were mixed in together, and we bargained through mime and counting on our fingers (no one spoke English). I bought a beautiful enamel turquoise and brass handbag, and five or six bizarre, ceramic shot glasses, which were more than a little breast-shaped. I also bought two lovely pottery vases, painted with pomegranate vines.